Virent is focused on providing the products made from crude oil today in a more sustainable way. Virent employs the use of Life Cycle Assessment (LCA) techniques to evaluate the environmental aspects and potential impacts associated with our processes and products. We utilize LCAs in our development process to ensure that our routes are effectively designed and sustainable. Our analysis includes the processes involved from feedstock production to end product use and all the steps in between. We utilize standard tools and techniques in concert with our in-house capabilities and partners to develop our LCAs. Today the majority of LCAs for biofuels focus on greenhouse gases (GHGs) or carbon intensity (CI). However, we have the tools to look at the broader set of sustainability data from water use to air pollution. The efficient use of resources and energy, together with efficient process design, is helping to ensure both economic and ecological benefits from our processes and products. Virent has used LCA techniques to evaluate our BioForming® technology for the production of chemicals and fuels. A key factor influencing the LCA is the choice of feedstock for the process. 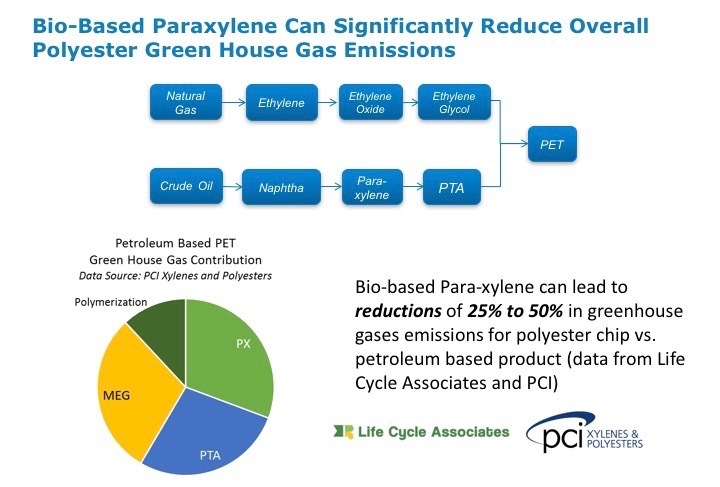 As an example, one external study showed that using a mix of sugar cane and corn based ethanol as a feedstock to produce bio-paraxylene results in a 70% reduction in carbon emissions vs. petroleum based paraxylene. We also studied the potential reduction in carbon using bio-paraxylene to produce 100% bio-polyester in a 3rd party study. This can lead to a 25% to 50% reduction in carbon emissions when compared to petroleum based polyester products. 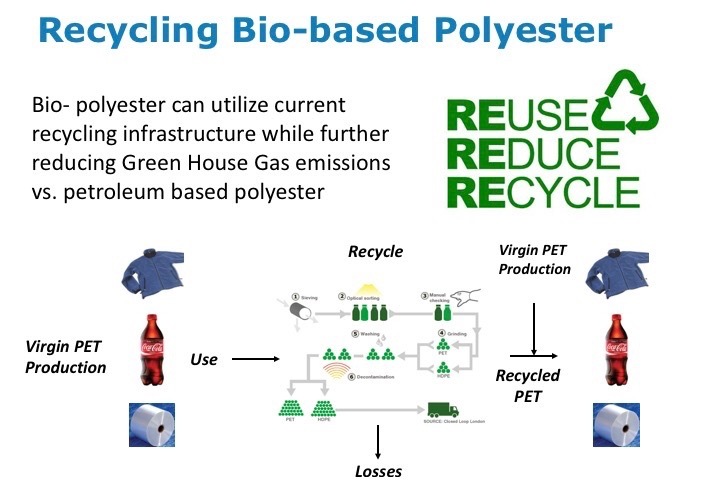 Another sustainability advantage of bio-paraxylene is that bio-polyester produced using bio-paraxylene can be recycled in the same recycling infrastructure as petroleum based polyester. 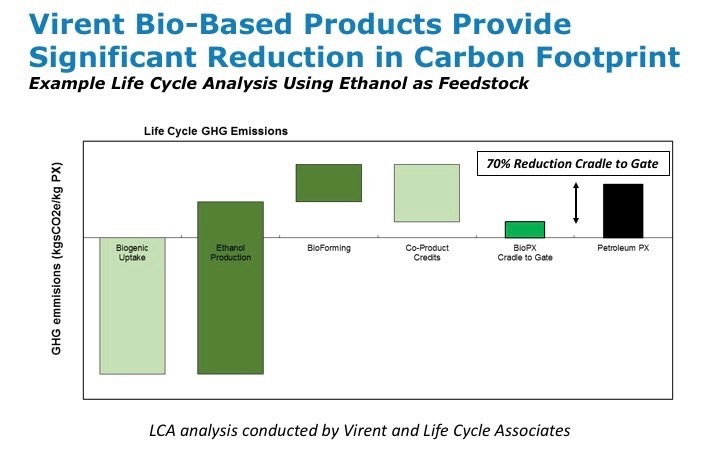 Virent and partners have also done LCA studies on our bio-gasoline that demonstrate we can achieve carbon reductions of at least 20%, and up to 60%, depending on feedstock choice.